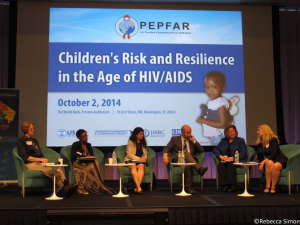 On October 2nd, 2014, PEPFAR hosted the Children’s Risk and Resilience in the Age of HIV/AIDS event in partnership with USAID, the Leadership, Management, and Governance (LMG) Project, the Human Sciences Research Council (HSRC), and the CDC in Washington, D.C. This event featured exciting presentations and panel discussions with top global experts on children, HIV/AIDS, and child development to highlight Children’s Risk and Resilience in the HIV/AIDS epidemic. The event was a culmination of two years of research and consultation supported by two USAID-funded projects under Management Sciences for Health: the LMG Project and AIDSTAR-Two, to deepen our understanding and response to both the short and long-term consequences of HIV and AIDS on children. Please see PEPFAR’s event page for additional information.